John Vincent Calipari (born February 10, 1959) is an American college basketball coach. Since 2009, he has been the head coach at the University of Kentucky. Calipari was previously the head coach at the University of Memphis (2000-2009) and the University of Massachusetts (1988-1996). He was also the head coach of the National Basketball Association's New Jersey Nets (1996-1999) and the Dominican Republic national basketball team in 2011 and 2012. Calipari has been to six (four official) Final Fours, four with Kentucky (2011-2012, 2014-2015). He also is top all time in vacated Final Fours with two. He had previously led UMass in 1996 and Memphis in 2008 to the Final Four, but those appearances were later vacated. However, Calipari himself was not personally implicated by the NCAA in the Memphis case. Calipari is the only head coach to have Final Four appearances vacated at more than one school. As a college coach, Calipari has 22 (21 official) 20-win seasons, 9 (8 official) 30-win seasons, and 4 (3 official) 35-win seasons. He has been named National Coach of the Year five times (1996, 2008-2010, 2015) and led Kentucky to its eighth NCAA Championship in 2012, the only title of his career. Calipari was born in Moon Township, Pennsylvania, a suburb of Pittsburgh, Pennsylvania. He is of Italian descent. Calipari lettered two years at UNC Wilmington before transferring to Clarion University of Pennsylvania, from which he graduated with a bachelor's degree in marketing. He played point guard at Clarion during the 1981 and 1982 seasons, leading the team in assists and free throw percentage. From 1982 to 1985, Calipari was an assistant at the University of Kansas under Ted Owens and Larry Brown. From 1985 to 1988, he was an assistant coach at the University of Pittsburgh under Paul Evans. From 1988 to 1996, he was head coach at the University of Massachusetts. From 1996 to 1999, he was head coach and Executive VP of basketball operations for the NBA's New Jersey Nets. During the 1999–2000 season, he was an assistant coach for the Philadelphia 76ers under coach Larry Brown, before moving on to his next position at the University of Memphis. He was inducted into the National Italian American Sports Hall of Fame in 2004. Calipari is famous for popularizing the dribble drive motion offense, developed by Vance Walberg, which is sometimes known as the Memphis Attack. Calipari is a published author with several titles to his credit, including the bestsellers Bounce Back: Overcoming Setbacks to Succeed in Business and in Life and Players First: Coaching from the Inside Out. In his 22 official seasons (23 seasons overall, 22 being official, with one entire season later being vacated) as a collegiate head coach, Calipari's record is 593–174 (.773). His record in the month of March is 107–37 (.743). His NCAA adjusted (the records of two appearances being removed) official record in the NCAA tournament is 38–12 (.760), and in the NIT is 15–6 (.714). His teams have made 15 NCAA tournament appearances (13 official, due to 2 later being vacated), including reaching the Sweet Sixteen 12 times (10 official, due to 2 later being vacated), the Elite Eight 10 times (8 official, due to 2 later being vacated), the Final Four 6 times (4 official, due to 2 later being vacated), the NCAA Championship Game 3 times (twice officially, with the 2008 Championship Game appearance while at Memphis being vacated by the NCAA), winning the NCAA Championship at Kentucky in 2012, and finishing NCAA Runner Up in 2014. As a college coach, Calipari has 21 20-win seasons (20 official) and 9 30-win seasons (8 official). He has also coached 6 teams to the NIT, winning the NIT Championship at Memphis in 2002. He is one of only four coaches in NCAA Division I history to direct three different schools to a #1 seed in the NCAA Tournament. From 1988 to 1996 at UMass, Calipari led the Minutemen program to five consecutive Atlantic 10 titles and NCAA Tournament appearances, including periods where the program was ranked first nationally. He finished with a 193–71 record overall, with a 91–41 record in Atlantic 10 conference games. Calipari was named Atlantic 10 Coach of the Year in 1992, 1993, and 1996. He was also named the Naismith, NABC, Basketball Times & Sporting News National Coach of the Year in 1996. He led UMass to its first-ever appearance in the Final Four with the play of the John R. Wooden Award winner and Naismith College Player of the Year Marcus Camby, although this appearance was later vacated by the NCAA because Camby had accepted about $28,000 from two sports agents who were luring him to enter the NBA draft after his Sophomore season. Calipari helped accelerate the construction of the Mullins Center, UMass' basketball and hockey facility. He also reached out to eastern Massachusetts and Boston to enlarge the fan base. Before moving on to the New Jersey Nets, Calipari became the second winningest coach in UMass history behind Jack Leaman. Calipari's greatest strength as a coach is his ability to create teams that play together. His 1992 Massachusetts team remains one of the most overachieving units The Minutes has ever seen, featuring a shooting guard with range so limited he made one 3-pointer all season (Jim McCoy), a 6-foot-3 power forward (Will Herndon), and a left-handed center who stood all of 6–7 (Harper Williams). Somehow, that collection of marginal talent went 30–5 and advanced to the NCAA Sweet 16. In the Sweet 16 matchup with Kentucky in 1992, official Lenny Wirtz issued Calipari a controversial technical foul for being outside the coach's box during a crucial UMass possession. Kentucky went on to face Duke in the next round in one of the greatest games in college basketball history, won on a last-second shot by Christian Laettner. In 1993, UMass defeated defending NCAA champion and preseason #1 North Carolina in the pre-season NIT in Madison Square Garden. The following year #3 UMass defeated defending NCAA champion and #1 Arkansas in the Hall of Fame Tip-Off classic, which resulted in UMass becoming the first New England college basketball team to be voted #1 in the Associated Press poll. During Calipari's tenure at UMass, the program became one of the most dominant in college basketball despite recruiting just one McDonald's All-American (Donta Bright) and having only two players drafted by an NBA team (Lou Roe and Marcus Camby). The 1996 team alone, called by Forde a team "with one superstar (Marcus Camby) and a collection of complementary parts", defeated teams featuring future first-round picks Tim Duncan, Allen Iverson, Stephon Marbury, Antoine Walker, John Wallace, Derek Anderson, Othella Harrington, Samaki Walker, Tony Delk, Brevin Knight, Nazr Mohammed, Jerome Williams, Ron Mercer, Lorenzen Wright, Todd Fuller, Walter McCarty and Matt Harpring. In an effort to start anew for the 1996–97 season, John Calipari replaced Butch Beard as head coach of the New Jersey Nets. After a 26–56 debut season, the Nets made a major draft-day trade in June 1997, acquiring Keith Van Horn, Lucious Harris and two other players for Tim Thomas. The 1997–98 season was a lone bright spot for the Nets in the late 1990s. The team played well under Calipari, winning 43 games and qualifying for the playoffs on the last day of the season. The Nets were seeded eighth in the Eastern Conference and lost to the Chicago Bulls in the 1998 playoffs in three straight games. The 1998–99 season was delayed for three months due to an owners' lockout of the players. When the abbreviated 50-game season began, the Nets were a fashionable choice by experts as a surprise team. However, Sam Cassell was injured in the first game and the team started poorly. With the Nets underachieving at 3–15, the Nets traded Cassell to the Milwaukee Bucks, while the Nets acquired Stephon Marbury from the Minnesota Timberwolves. After two more losses, Calipari was fired as head coach with the team at 3–17. He finished his tenure with an overall record of 72 wins and 112 losses, and a .391 overall winning percentage. He then joined Larry Brown as an assistant coach for the Philadelphia 76ers. While coaching the Nets, Calipari became a resident of Franklin Lakes, New Jersey. In Calipari's first nine years as head coach at Memphis, he won 214 games (38 wins were vacated), posted seven consecutive 20-win seasons, plus one more in his final season (including an NCAA record four consecutive 30-win seasons, though the third season was vacated and this record no longer holds) and earned seven consecutive postseason bids (plus one in his final season). His 2007–2008 team's 38 victories set a new NCAA Division I Men's Basketball record for most victories in a season, a record that now belongs to the 2011–2012 Kentucky Wildcats due to NCAA violations that vacated all of Memphis' wins. The nine consecutive 20-win seasons and the nine consecutive postseason appearances would have been the most in school history, though that officially stands now at seven because of the vacated 2007–08 season. He was named Conference USA Coach of the Year in 2006, 2008, and 2009. In 2008, he was named Naismith College Coach of the Year, receiving the honor for the second time. In 2009, he was named Sports Illustrated College Basketball Coach of the Year. He built a national program by recruiting blue chip players from the Eastern part of the country, such as Dajuan Wagner from Camden (NJ), Darius Washington Jr. from Orlando (FL), Rodney Carney from Indianapolis (IN), Shawne Williams from Memphis (TN), Joey Dorsey from Baltimore (MD), Chris Douglas-Roberts from Detroit (MI), Antonio Anderson from Lynn (MA), Robert Dozier from Lithonia (GA), Derrick Rose from Chicago (IL), and Tyreke Evans from Aston (PA). While at Memphis, Calipari popularized the dribble drive motion offense that was invented by former Pepperdine basketball coach, Vance Walberg. On January 21, 2008, Calipari led the Tigers to the No. 1 ranking in the AP Poll for only the second time in school history. In 2006 and 2008, Memphis earned a No. 1 seed in the NCAA men's basketball tournament. In 2008, Calipari's Tigers advanced to the national championship game, their first under his leadership. They also won 38 games, the most regular-season wins in NCAA history (his 2011-12 Kentucky team would also go on to win 38 games). His team, however, would lose to the Kansas Jayhawks, 75–68, in overtime. This team would later have its entire season record vacated by the NCAA due to the ETS invalidating Derrick Rose's SAT. Despite this, Rose still denies any wrongdoing. The NCAA began to investigate the test and contacted the ETS. Because the NCAA had began to investigate the ETS decided to review the test. The ETS sent three letters to Rose's family's former address in Chicago,(instead of to his dorm in Memphis,) asking that he verify some information on his test. Because he did not reply to the letters the ETS invalidated the test. Even though the NCAA investigated the test and reported that they could not find significant evidence to prove that Rose did not take the test. Because the ETS had invalidated the test the NCAA went back and retroactively declared Rose ineligible. To this day the official position of the NCAA is that he did take his own test. If not for the vacated wins, Calipari would be the winningest coach in Tigers history, as he would have 252 wins to Larry Finch's 220. On March 30, 2009, four days after Memphis' season ending loss to Missouri in the NCAA Tournament, multiple sources reported that Calipari would agree to be the head coach at the University of Kentucky, after UK's head coach, Billy Gillispie, was fired after two unsuccessful seasons at the school. Calipari rejected a counter offer by Memphis for Kentucky's 8 year, $31.65 million contract. According to university officials, John Calipari signed a written contract on March 31, 2009. The contract was worth $34.65 million over 8 years, plus incentives. 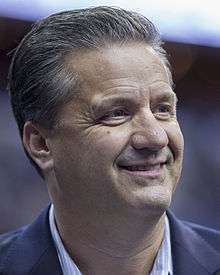 On April 1, 2009, the University of Kentucky Director of Athletics, Mitch Barnhart, formally introduced John Calipari as the new coach of the University of Kentucky Wildcats. During the press conference, Calipari spoke at length about his relationships with former UK basketball players and coaches, and also in his difficulties in accepting the UK job, largely due to his deep emotional ties with both the city of Memphis and University of Memphis. Calipari stated, "Coming to UK was the easy part, it was leaving the city of Memphis that was the hard part." He went on to refer to the University of Kentucky coaching position as his "dream job". In the end, Calipari became the 22nd coach overall at Kentucky, and just the 7th coach in the last 79 years for the Wildcats. In his first year as head coach, Calipari had a highly touted recruiting class, including the No. 1 overall rated recruit, John Wall, plus fellow 5-star recruits, DeMarcus Cousins, Eric Bledsoe, and Daniel Orton. On December 21, 2009, Calipari led the Cats to their 12th victory of the season and the program's 2,000th victory ever. Kentucky won its 44th SEC Regular Season Championship in 2009–10, with a 14–2 conference record. Calipari's team followed this up with the UK's 26th SEC Tournament Championship, with an overtime defeat of Mississippi State, 75–74, in the SEC Tournament title game. In the NCAA Tournament, however, No. 1 seed Kentucky (East Region) was upset by West Virginia in the Elite 8, to finish the season at 35–3. In his second season at Kentucky, Calipari recruited the No. 1 rated point guard in the 2010 class, Brandon Knight. In addition to Knight, Calipari also signed two other 5-star recruits, Terrence Jones and Doron Lamb. In 2010–11, Kentucky finished the regular season with a record of 22–8, with a 10–6 record in SEC regular season play. UK would go on to win its second consecutive SEC Tournament Championship, defeating Florida, 70–54, in the SEC Tournament title game. As a result, Kentucky received a No. 4 seed in the NCAA Tournament (East Regional). During the NCAA Tournament, Kentucky would go on to defeat No. 1 overall seed Ohio State, 62–60, in the Sweet-16. In the Elite Eight, Calipari's team would avenge an early season loss to North Carolina, by defeating the Tar Heels, 76–69, securing Kentucky's first Final Four appearance since 1998. In the Final Four, UK fell to the eventual NCAA Champions, UConn, by one point, 56–55, finishing with a final record of 29–9. In this third season, Kentucky landed another No. 1 recruiting class with four consensus five star players: Anthony Davis, Marquis Teague, Michael Kidd-Gilchrist and Kyle Wiltjer. Kentucky came into the season ranked #2 in the country. They finished the regular season with a 30–1 record, their only loss to Indiana by a buzzer-beater and went 16–0 in conference play. In the SEC tournament, Kentucky lost in the championship game to Vanderbilt 71–64. In the NCAA Tournament, Calipari's team was selected as the overall #1 seed in the tournament, representing as the South Region #1 seed. Kentucky avenged the early season loss to Indiana beating them in the Sweet Sixteen 102–90, and knocked off Baylor in the Elite Eight 82–70, to advance to their second consecutive Final Four. In the Final Four in New Orleans, Kentucky first faced their in-state rival, the Louisville Cardinals and Rick Pitino, winning 69–61. Two days later, in the National Championship game, Kentucky played in another early season rematch against the Kansas Jayhawks, winning a hard fought contest 67–59. The win secured Calipari his first NCAA Championship, a NCAA record 38-win season, and the 8th overall NCAA Championship for Kentucky. By doing so, John Calipari became the 5th head coach to win a NCAA Championship at Kentucky (a NCAA record), and the first coach to do so at the school since Tubby Smith in 1998. Following the 2012 championship, UK Athletics Director Mitch Barnhart announced on May 4 that Calipari's contract had been renegotiated. Under the new contract, Calipari will make up to $8.0 million annually  (not including bonuses), which further cements his status as one of the most highly compensated college basketball coaches in the country. Mike Krzyzewski, coach of the Duke University team, leads the NCAA at an annual salary of $9.8 million. On September 11, 2015 John Calipari was inducted into the Naismith College Basketball Hall of Fame. As of the 2015-2016 NCAA Division I college basketball season, John Calipari is one of only 6 active coaches enshrined (Mike Krzyzewski, Jim Boeheim, Roy Williams, Rick Pitino). UMass had its 4–1 1996 NCAA Tournament record vacated when the NCAA discovered that UMass player Marcus Camby had accepted a reported $40,000 in cash and gifts from an agent. In 1997, while coaching the New Jersey Nets, Calipari directed profanities at Star-Ledger sports reporter Dan Garcia and referred to him as a "Mexican idiot". Garcia sued for $5,000,000 for emotional distress. Though the case was dismissed and Calipari apologized for his remarks, he was still fined $25,000 by the NBA. The NCAA investigated allegations that a player on the 2007–08 University of Memphis team committed "knowing fraudulence or misconduct in connection with his entrance examination" and had an unknown individual complete his SAT examination. The NCAA informed Calipari in a letter that he was not considered "at risk" in this investigation. The player was identified as Derrick Rose. Subsequently, allegations surfaced that Rose's brother, Reggie, had been allowed to travel to Tiger road games for free. On August 20, 2009, the NCAA ruled that Rose was ineligible and forced Memphis to vacate the entire 2007–08 season, including the NCAA Tournament and its standing as runner-up. It took the line that because Rose's SAT score had been voided by the Educational Testing Service, which administers the SAT, strict liability required that Rose be ruled ineligible even though Memphis officials hadn't known at the time that Rose was ineligible. The committee also determined that even without the questions about his SAT score, Rose would have lost his eligibility in December 2007 due to his brother being allowed to travel with the team for free. On October 7, 2011, the Memphis Commercial-Appeal reported that on May 28, 2010, John Calipari, Derrick Rose, and University of Memphis athletic director R.C. Johnson reached a $100,000 out-of-court settlement with three attorneys who represented Memphis season ticket holders and threatened a lawsuit over the vacated 2007–08 season. Also as part of the settlement, Calipari donated his near-$232,000 bonus to the Memphis scholarship fund. On February 26, 2011, after Kentucky beat the Florida Gators in Rupp Arena, Calipari was recognized for his 500th career victory as a Division I men's basketball coach. Over the course of the next few months, the NCAA's Committee on Infractions (COI) and the University of Kentucky exchanged letters debating whether Calipari had indeed reached the 500-win milestone. Due to games vacated by the NCAA in two different seasons (the 1996 season at UMass and the 2008 season at Memphis), the NCAA only officially recognized Calipari's 500th all time coaching victory on March 15, 2012. On June 13, 2011, Eamonn Brennan, of ESPN.com, broke the story on a college basketball blog, revealing that Calipari and other Kentucky officials may have to appear before the COI for the celebration previously mentioned and for lack of compliance. * ^a b c UMass had its 4–1 record in the 1996 NCAA tournament and Final Four standing vacated after Marcus Camby was ruled ineligible due to his contact with a sports agent. ** ^a b c d e f Memphis had 38 wins and 1 loss from their 2007–08 season vacated by the NCAA due to academic fraud not directly related to the university. *** ^ Under current NCAA official records, Calipari's record is 620-185 (.770), which accounts for the 4 vacated wins (and one vacated loss) in the 1995–96 NCAA Tournament at UMass, and the 38 vacated wins (and 1 vacated losses) at Memphis in the entire 2007–08 season. 1 2 "April 27, 2009, Letter from NCAA to John Calipari" (PDF). Louisville Courier-Journal. Retrieved 2009-06-01. ↑ S.L.Price (March 14, 2011). "Too Slick, Too Loud, Too Successful Why John Calipari Can't Catch A Break". Sports Illustrated. ↑ "Kentucky holds off Kansas to win eighth national title". ESPN. April 2, 2012. ↑ Tait, Matt (April 2, 2012). "John Calipari talks about KU days". Retrieved 2 April 2012. 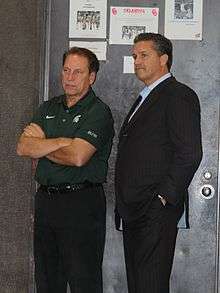 ↑ Scott, John Calipari with David (2009). Bounce back : overcoming setbacks to succeed in business and in life (1st Free Press hardcover ed.). New York: Free Press. ISBN 9781416597506. ↑ Calipari, John; Sokolove, Michael (2014). Players first : coaching from the inside out. ISBN 978-1594205736. "Hoops" Weiss. FOXSports.com. "Calipari using familiar formula for success "
↑ DeCourcy, Mike (1997). "An asterisk can't ruin UMass' Final Four dream | Sporting News, The | Find Articles at BNET". Findarticles.com. Retrieved 2009-08-09. ↑ "05FB-29-40" (PDF). Retrieved 2009-08-09. 1 2 Forde, Pat (2010-02-23). "Chemistry lesson: handing out grades". Forde Minutes. ESPN.com. Retrieved 2010-05-07. ↑ Cook, Ron (5 April 2008). "Memphis coach Calipari remembers his roots". Pittsburgh Post-Gazette. Retrieved 5 April 2012. ↑ Dobrow, Marty. "NBA education of John Calipari", copy of article from the Daily Hampshire Gazette, March 13, 1998. Accessed May 25, 2011. "They live in a wooded section of Franklin Lakes in North Jersey, far from the turnpike, far from the fray. It's a big house on a cul de sac, but not ostentatious. Not gated. Not shrouded in high shrubs. Just quiet. Calipari says that in a year and a half on the job he has been to New York City eight times, four of them when he's played the Knicks. 'I'm not a New York City guy,' he says." ↑ "Blake Griffin, John Calipari lead SI.com's All-America team". Sports Illustrated. March 18, 2009. ↑ "Small Ball Revolution, Memphis Attack". Coachingbetterbball.blogspot.com. Retrieved 2009-08-09. ↑ Mike DeCourcy. The Sporting News. "Pepperdine's offense is a recruiting tool, too"
↑ Andy Katz. ESPN.com. "Calipari committed to turning Memphis into legit contender"
↑ WHAS11 News "John Calipari accepts offer to be new UK basketball coach", WHAS-TV, 2009-3-30. Retrieved on 2009-3-30. 1 2 ESPN News Services "Source: Calipari taking UK job", ESPN, 2009-3-31. Retrieved on 2009-3-31. ↑ Tom Van Riper (2012-03-05). "The highest-paid college basketball coaches". Forbes. Retrieved 2012-05-05. ↑ Associated Press (2012-05-04). "Kentucky gives Calipari a raise following NCAA title". Washington Post. Retrieved 2012-05-05. ↑ Phil Taylor (1997-09-15). "Tangled Web". Sports Illustrated. Retrieved 2009-08-09. ↑ Monte Burke (2012-03-13). "John Calipari is Either the Best or the Worst Thing to Happen to Basketball". Forbes. Retrieved 2012-03-28. 1 2 Roberts, Selena (March 25, 1997). "Calipari Apologizes Publicly for His Slur". New York Times. ↑ "NBA education of John Calipari". Umasshoops.com. 1998-03-13. Retrieved 2009-08-09. ↑ Roberts, Selena (March 27, 1997). "Stern Fines Calipari $25,000 for Insulting Reporter". New York Times. ↑ CBSSports.com wire reports (2009-05-28). "AD defends Memphis of any wrongdoings, won't confirm alleged player—NCAA Division I Mens Basketball—CBSSports.com News, Fantasy, Video". Cbssports.com. Retrieved 2009-08-09. ↑ O'Neil, Dana. Memphis also gets 3 years' probation. ESPN, 2009-08-21. ↑ Veazey, Kyle (October 7, 2011). "Threat of lawsuit brings bonus repayment from John Calipari, R.C. Johnson, donation from Derrick Rose". Memphis Commercial-Appeal. Retrieved May 16, 2014. ↑ Ervin, Wade (2011-06-14). "NCAA calls John Calipari's win total wrong". Retrieved 14 June 2011. ↑ Brennan, Eamonn (June 13, 2011). "NCAA calls John Calipari's win total wrong". ESPN. Retrieved February 26, 2012.